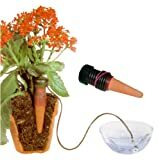 Self Watering Probes are a simple and effective way of watering your plants while you are on vacation. Just soak them in water for a couple of minutes to prepare the tips, then insert the probes into the soil of your potted plants and place the hose ends in a water reservoir nearby. The water will be slowly emitted through the ceramic cones, automatically watering your plants without the need to set timers or worry about electronic devices being turned on while you are away. Includes 5 self-watering probes (and hoses). No electronics or complicated timers to set. May use liquid fertilizer in water if desired. One of those truly great products that performs exactly as advertized and continues to perform, year after year. I have 25 of the self-watering probes and have used them several times over the past 4 years for up to 6 weeks at a time. For a 6" pot a 1/2 gallon reservoir is sufficient for a month. For a 12" pot, use a 1 1/2 gal. container. For 24" pots, I use two probes drawing from a 2 1/2 gal. container. Make sure to place the bottom of the container at about the same height as the soil line. Placing it higher or lower will somewhat increase or decrease the flow, respectively. When installing, cap the probes under water to prevent formation of an air bubble in the tube. First you can't use them in a clear container. Two you can't use them when your watering container is higher or on the same level as the plant. Three the cord is short and is very obvious. IF you put the plant on a side table and the container on the floor, the cord can't reach the floor and there for can't reach the bottom of the container. If you put the plant on the table and the water container on the table, the water will be too high and will over water your plant. If you use a clear container it will grow algae and look gross, really, really quickly. So dark container below the plant but not too far below the plant. Probe must be thoroughly soaked and full of water before inserting into plant. Check every couple of days to make sure that probe took (easy enough, check if probe is still full of water). Repeat process if probe didn't take. Check regularly to see if probe is still working. If you accidentally let the water go below the end of the cord, you must redo initial process even if probe is currently full. they did they were supposed to do. I have 10 outdoor plants (6 Geraniums & 4 Ferns) that I was hoping to save over the winter. I've got the 10 probes sharing the water from 3 different one gallon buckets. After two months all are doing quite well & showing new growth. You can see that soil is moist without being drenched. The one suggestion I have is for larger plants to plan on buying two probes. My largest plant (which is still doing well) is the only one that appears a little on the dry side at times. I purchased 1 pack of 5 probes. They work very well so far. I am using them to water my plants I am over-wintering in the greenhouse. I just put a couple of buckets of water about the floor and dropped the ends of the tubes in. I have to refill or top off the buckets every so often. I've been using these for a little over two weeks as a test run for when I travel for a month later in the summer, and they basically work like an IV for your plants. In that regard they do work as advertised. However, I have found that most houseplants do not do well on a continuous supply of water. I have a wide variety of houseplants, the only ones that seem to do well with these are the palms. Most of my other houseplants now have fruit flies hanging around them attacking the roots. 2 of my plants I had to actually throw out because the roots started rotting. I am letting my other plants dry out, hopefully I can save them.